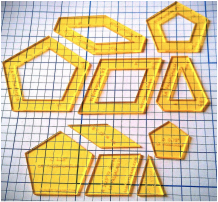 ​Custom-made Laser-cut Acrylic Quilt Templates - Hand-made Join our Mailing List! I specialise in hand-making and selling unusual, re-sized or hard-to-find template sets for modern and traditional quilt blocks. Please see the available range in the Shop. These attractive, accurate, precision-cut acrylic templates are individually laser-cut from 1/8th inch thick (3mm) rigid Cast Acrylic or Plexiglas, as used in commercial rulers. All templates are drawn by me in AutoCAD (via Computer Aided Design software) for mathematical correctness, and then hand-made (laser-cut) by me (Lisa). Each piece is individually polished, sanded and carefully wrapped to ensure safe postal delivery. ​(Due to current Studying commitments, I have temporarily suspended accepting requests for custom-made orders, until further notice - from 18April 2019). 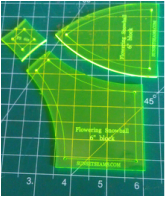 ​"Solid" Templates allow you to accurately rotary-cut several layers of fabric at once. "Window" Templates help with hand-sewing projects. You draw around the outside edge (for the fabric cutting line) and draw along the inside edge (for the hand-stitching line). Great for portable projects. "No Seam" Templates are useful to draw and cut out your own Paper Pieces, for English Paper Piecing ("EPP"). These Acrylic Templates are durable, easy for beginners to use, and can be any shape or size (up to a maximum of 12 x 12 inches), in any transparent colour that we offer (subject to availability). Please note: We do not provide or sell patterns or copies of patterns, nor provide quilt-making instructions nor fabric requirements. We are not able to copy Acrylic Templates that are already available from other stores. We encourage and support patronage of your LQS (local quilt store) for standard-sized, mass-produced templates & rulers which are already commercially available.